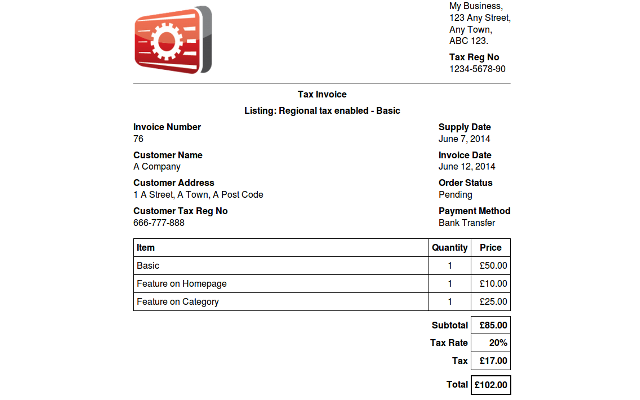 Invoices can be viewed online as HTML or downloaded as PDF files! Invoices can be accessed during the order process. Invoices list on the Vantage user dashboard. Invoices list on the JobRoller user dashboard. 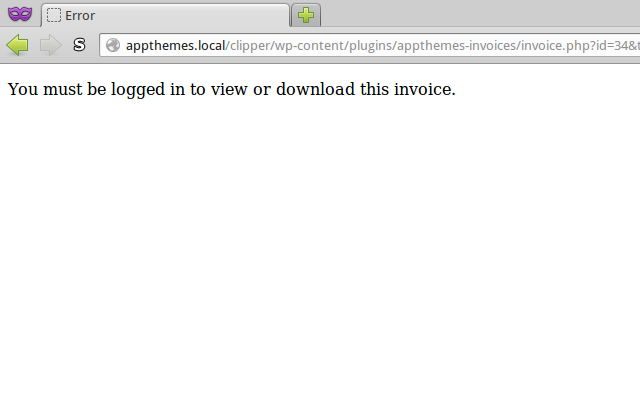 Invoices list on the Clipper user dashboard. 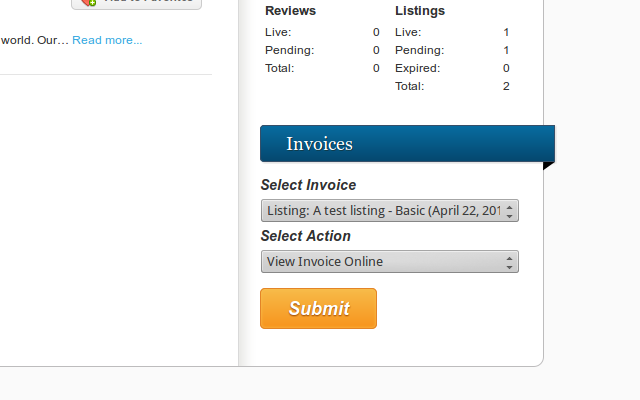 Invoices list on the ClassiPress user dashboard. Invoices are secure and can only be downloaded or viewed by admin users or the customer. 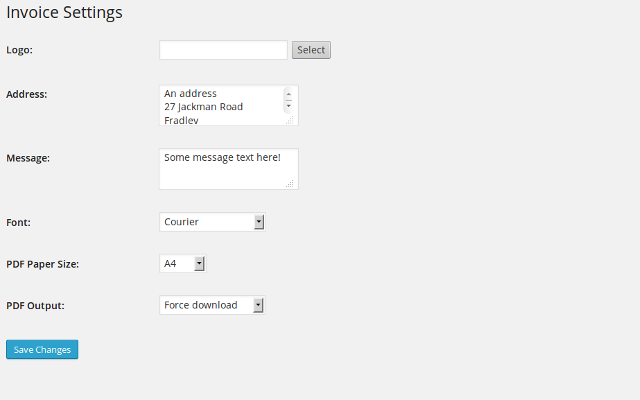 View or download invoices from the Orders table. 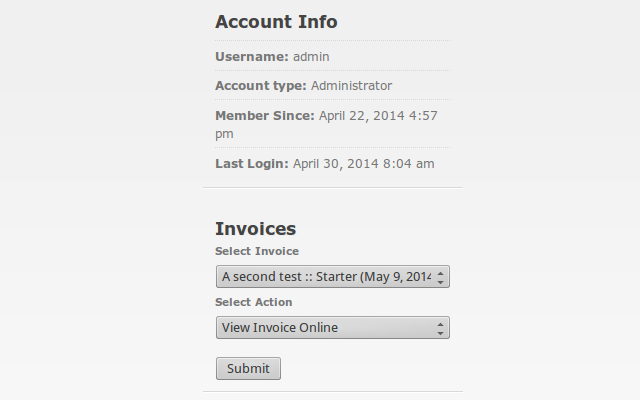 View or download invoices from Order admin pages. 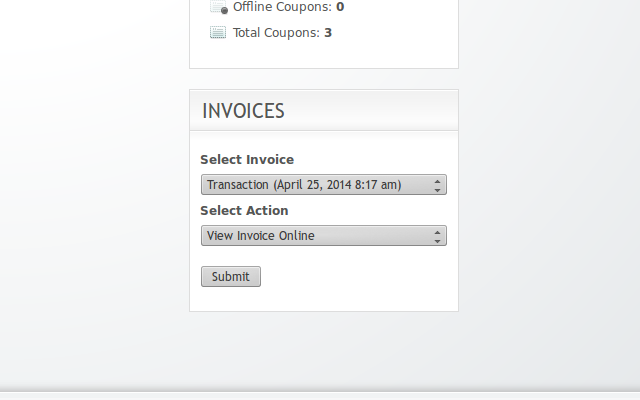 Invoices is a must have plugin! Show your customers you take your business, and theirs, seriously by allowing them to download professional invoices of their orders. Manage your accounts by downloading or printing invoices of transactions. Invoices can be viewed online in HTML format or downloaded as PDF files! Value for money – Compatible with ClassiPress, Vantage, JobRoller, Clipper, HireBee and Taskerr! Secure – Invoices can only be viewed or downloaded by the site admin or the customer. Translation ready – POT file included for easy customisation or translation of text. Admin – View and download invoices from the Orders dashboard. Frontend – Customers can view and download invoices from their user dashboard. Multisite – Developed and tested in a multisite environment to ensure WP network compatibility. Tax Compliant – Invoices are compliant with UK full VAT requirements. If you need different/extra information for your country please click on the Support tab for contact details. 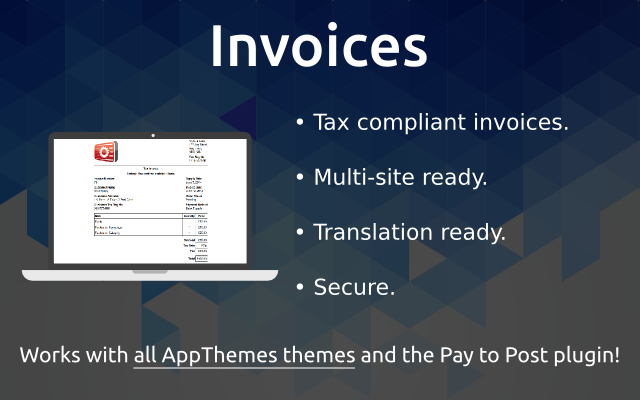 The Invoices plugin is tested against the latest version of WordPress and the development versions of each theme. Please ensure you have the latest dev version of ClassiPress, Vantage, JobRoller or Clipper which can be downloaded from the Purchases page of your dashboard. 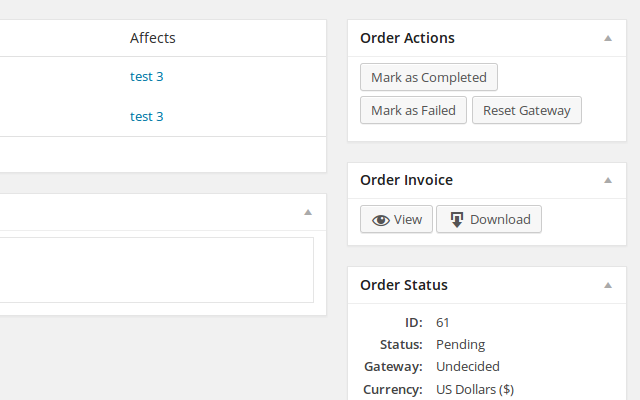 – Added option to hide invoices for free (0 value) orders. 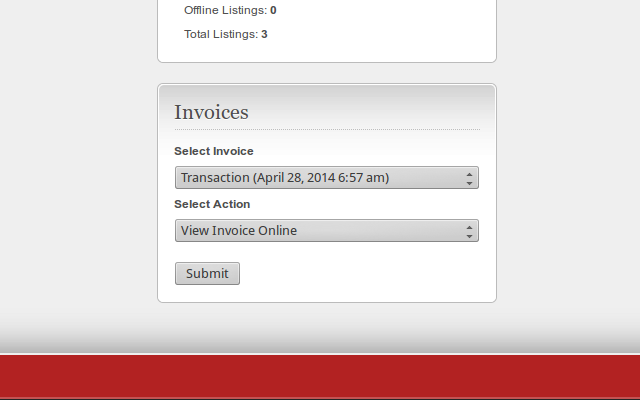 – Added option to allow admin to set the status an order must have in order for invoices to appear in invoice widget. – Fixed JobRoller bug – Invoices now hidden from JobSeekers. – Added support for sequential order numbering. – Added OpenSans and Inconsolata fonts with extended latin characters. – Removed unused fonts which halves the size of the plugin archive. that plugin will kill your server resources as it is badly written and will make your Mysql query run 1000 more time than needed. Plugin teuer gekauft, installiert, aber es funktioniert nicht. Can ad custom fields be added on invoice? 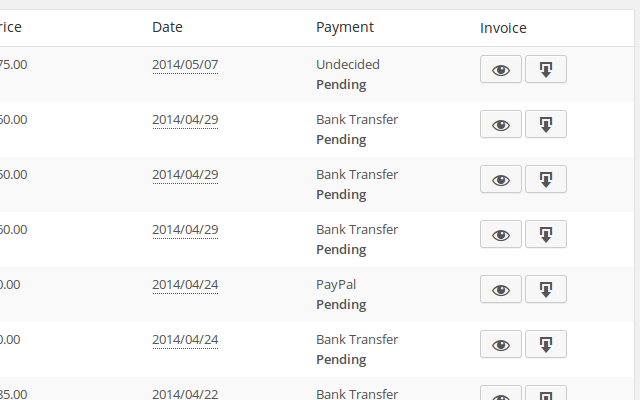 This plugin provides much needed invoicing capabilities and does so with elegance and simplicity. The support is excellent and it is very much appreciated. Kudos to the developer! Autor’s support work perfectly! Plugin grows all the time and become more usefull for everyone. Would be good if invoice could be provided in a confirmation email to the customer. This plugin is really nice and easy to use… my customer will love it. Still some minor enhancemnts to add but generally, it is great. It is a nice extension for Vantage, easy to handle for devs. It would be great if there is a unique invoice number that can be generated with every invoice: 001, 002, 003, etc. It is necessary as to proceed the invoice as legitimate in many countries. I’m Searching Every Were, This I Think Is The Closest . If Someone Wanted To Buy The Item Listed, Could Someone Press A Button To Say They Wanted To Buy And Receive Payment Instructions , Then Pay , Then Seller Marks Item As Being Processed And Shipped Etc. Is it possible to not generate invoices when value of the order is equal or maller than zero (gratis pack with price = 0)? Currently I can hide invoices for users but in this case numeration still go ahead. The law in Poland doesn’t allow for the VAT invoicing with the value zero. any support on that plugin? Yes it’s killing word press installation. Memory peak is incredibly high with activated of this plugin. Does this plugin work with latest versions of WP and Vantage? Thinking about purchasing, but concerned about recent comments indicating potential issues. Please advise. Thanks. 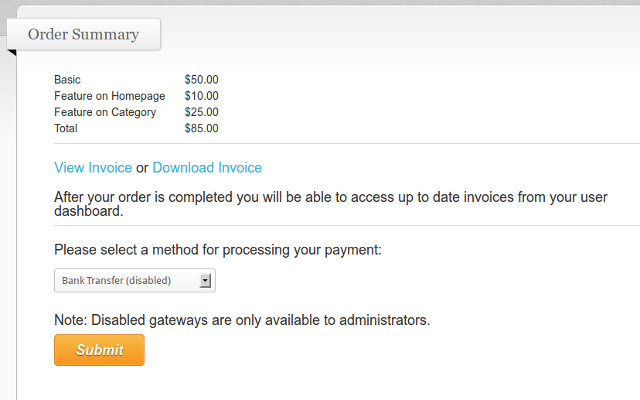 When the complete order email is sent, at this point, can we setup with this plugin to attach a invoice (receipt)? I intent to use it after the payment process completed. So, my users can receive a confirmation (receipt) of the purchase. Andre, an invoice is not a receipt. It is a request for payment. An invoice is not a legal receipt. The APP Themes use an email notice to send a pre-made receipt. However, this was grossly under developed. The assumption being, your payment gateway sends the actual receipt as proof of payment. And that is where you customize the receipt with your company’s logo and tax ID’s. However, the conditions of my project handed to me, was to brand the email notice to be an actual receipt. So I hard coded this in the email php file for this project(not APP Themes Project). I would say APP Themes, could further develop and provide a backend panel to customize ALL email notices. However, in the meantime, the only reason a customer would want an invoice, is only if payments are billed AFTER services, such as submitting ads. It is quite redundant and useless to send out invoices with the receipt. As it has no meaning to the customer, nor their country’s governing body collecting taxes. Further information regarding the legality and use of receipts and ind invoices can be sought from a reputable tax accountant in your country. Side Note: I reviewed the images of this plugin, and I am at odds to explain why the developer even has download links in the payment process? Invoices are tossed out once payment receipts are received. As these are the only documents useful to a company and solely for the purpose of taxation, cash flow statements, and balance sheets. Again, invoices are what you send to your customers BEFORE payment is due. Not during the payment of such invoices. Sorry about the terminology. You are absolutely right. My intention is to send a pre-made receipt when the order is completed (paid and published). Can be in html or attached in pdf format, but with a impressive style. Seems like a very needed plugin required here. And imho, it should have already been done and part of each APP Theme. To get what you want will require design work coded in the email.php file. Also some further reading and testing your emails being sent out, would do you a world of good Andre. Google has tools for testing how your emails are being accepted, using GMail. Thanks for your answers, but I finally realized what I’m looking for. What I need is the functionality “Order History” equal to AppThemes site. So, the users can see the complete list of orders, the detail of each order and the associated Receipts. Do you know if such plugin exists or something similar? Is it compliant with the new EU VAT rules since 2015 for online services? Which means the double-proof of customer’s location to apply the correct VAT rate? When is a proper fix coming out? It really needs an update ASAP, it is taking up a lot of my resources and causes an error_log to get huge! Dont buy at appthemes. You dont get anything after your payment. You will lose money and time. keep away from them. Hi there, Is it compatible with Vantage 4? Marketplace is warning that this item is no longer available for sale. Is that true? I’m really interested in such plugin. It seems to be outdated. Could you release an updated version for new versions of WP, CP, etc?